Beautiful designs by one of the best in the business. Most use right angle weave and peyote stitch, and lots and LOTS of crystal! Sabine has many more patterns for sale (and for free) at her website TryToBead.com. If you love cube beads, then this is the book for you! There are over 25 gorgeous designs using the ladder, herringbone and peyote stitch. Beautiful collection of patterns using embellished right-angle weave and tubular peyote stitch. 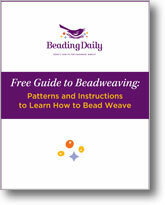 BeadingDaily.com has 25+ free e-books, covering every topic from bead weaving to bead making. Joining is free and well worth it. This "special collector’s edition" magazine includes 43 gorgeous beadweaving projects from past Beadwork issues, including some of Beadwork’s best patterns from bead designers Marcia DeCoster, Lisa Khan and Jean Campbell, just to name a few. 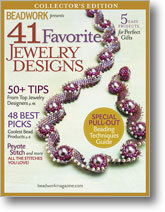 Another "special collector’s edition" magazine that includes 41 favorite beadweaving projects from past Beadwork issues. A beautiful collection of designs. I originally bought this book before it had been translated from French to English. Even in French, though, I could easily follow her diagrams, and I just lover her designs. If you love cube beads, then this book is for you. Instructions are step-by-step but I would describe them as being more for advanced beaders. The designs are positively lovely. Excellent instructions for some beautiful designs—everything a beading book should be but very rarely is. The book is a winner! Another well-written and beautifully illustrated book from Diane Fitzgerald, this one focusing on using cylinder beads and other embellishment beads to form two- and three-dimensional forms. Very nice job! A collection of 27 favorite patterns from Bead & Button magazine that take seed beads and beadweaving to the next level. A wonderful compilation of 27 peyote stitch patterns from Bead & Button magazine. This book is definitely for advanced beaders but it has some incredibly beautiful designs using single needle right-angle weave (flat and tubular). If you are somewhat familiar with right-angle-weave and enjoy it (as I do! ), then this book is for you. Great books for beginning beadweavers. It includes step by step instructions and a design for a number of bead weaving stitches, including the peyote stitch, brick stitch, right-angle weave daisy chain and others. I love this book. It has a multitude of great projects that cover just about every beadweaving stitch and technique. It's also well illustrated with step-by-step instructions. Advanced beaders may find it too easy but beginner beaders will find plenty to be thrilled about. Plus, it's spiral-bound! If you want to learn how to bezel a rivoli, then this is the book you need. It may seem dense at first but that's because it is. You need to sit down and actually read the first 30 pages before you even begin to bead. This is a lovely book with some great projects. The step-by-step instructions are much better than your average bead book and there are lots of illustrations. My brother gave me this book for Christmas and what a little delight it is! It measures only 4.4 by 6 inches—about the size of a diary—but is packed full of useful reference information in easy question and answer format. It would be a wonderful gift for beginner beaders. Translated from the Japanese versions, the projects in these two books cover a number of beadweaving techniques and stitches—peyote, herringbone, netting, brick, RAW. The directions are very good and there's lots of illustrations and photos. Beautiful collections of some of Sandy's prettiest bracelets. You can find more patterns at her website: SandraHalpenny.com. This book features sixteen of Sandy's necklaces, all beautifully illustrated with step-by-step instructions. It starts with relatively simple necklaces and progresses to more complicated patterns. She also has a number of e-books and patterns available at her website: SandraHalpenny.com. Many people probably buy this book to get the pattern for the necklace on the cover (and I was one of those people). It is beautifully illustrated with both color photos and diagrams, and has instructions for beaded rings, lariats, necklaces, chokers, broaches, earrings, beaded beads, hair ornaments, cell phone straps and eyeglass chains. Most of the patterns require the two-needle, Japanese-style cross-weaving technique, and although there are some written instructions (in English), you primarily have to be able to follow the diagrams, which are better than most, however. Bead Fantasies II, III and IV are also now in print. This book features 25 great bracelet projects that have appeared in Bead & Button Magazine over the last ten years. As with the instructions in Bead & Button Magazine, the patterns are sometimes over-zealously edited down for space, but there are a great many wonderful designs in this book that are worth the head-banging. If I had just one book to suggest to all beginning beaders, it would be this one. Beading with Ruby is self-published so don't expect a fancy print job and slick glossy photos. It is, however, chock full of great information and 30 start-to-finish beaded projects with illustrated and detailed instructions on most every bead weaving technique that exists: netting, chevron, right-angle weave, peyote, brick... and on and on. This book is a real treasure and worth every dime. Diane Fitzgerald has written a number of books and this one is especially good if you're looking to master the brick stitch. The first 25 pages are dedicated to the history of the brick stitch and illustrated with a great many beautiful photographs of beadwork from around the world. There are several projects, including the "Crossroads Bracelet," which is a personal favorite. There's quite a few wonderful designs in this book and although the directions are way better than most beading books, Beading with Crystals isn't for the inexperienced beader. There's several stunning wirework projects. Chris uses a compass metaphor to explain the theory of right-angle weave, which I found very helpful. I have to admit that I bought the book for the "Carnelian and Garnet Necklace" pattern on the cover. It's a versatile design that you can make using a number of different bead types and shapes, and it's just so darn lovely. Although this book is written entirely in Russian, bead book sellers are having a hard time keeping this one on the shelves. The first printing in 1999 sold out almost immediately, and the 2nd edition, printed in 2002, is hard to find. Sometimes Spangles in the UK has it in stock. Your best bet is to keep an eye out for it eBay. So what is all the fuss about? It looks just like a college text book but as you flip through 400+ pages of color diagrams and photographs, you can't help but think that you've stumbled upon a real gem, especially if you love net weave. Even though the text is in Russian (and there's a lot of text... I wish someone would translate it for me), the diagrams are thorough and extremely easy to follow. The designs are absolutely exquisite and along with net weave, there are diagrams for necklaces and bracelets created with the daisy chain, chevron stitch, right-angle weave, numerous spiral techniques, peyote, loomwork and even the Japanese Hana-ami motif. This is the best beading book in existence today. Books from this series consist of reprinted articles from Bead & Button magazine. As in the magazine, there's always a good selection of patterns in every volume. Stringing, wirework, and bead weaving designs are well represented by many excellent designers. This book has nine great bracelets from Bead & Button Magazine, which include the infamous "Hugs & Kisses Bracelet" and "Crisscross Bracelet," a couple nice Ndebele (herringbone) bracelets, a peyote beaded bead bracelet and several others. A good deal for the price. There are a number of books in this series and each contain some lovely and delicate beaded projects. The directions are in Thai but the diagrams are quite easy to follow if you know a bit about Japanese-style beading (or cross-weaving). What has always impressed me most about these books (beside some of the beautiful beaded jewelry) is the beautiful full-color print job and the fact that they sell for about $7.95 to $12.95 when most other American full-color books of less-than-equal print quality sell for twice that much. This is a wonderfully handy little bead reference book. It's small, spiral bound, printed on nice heavy paper stock and contains all sorts of beading essentials from bead sizing info to findings, knotting, adhesives, threading materials... you name it.